So you’ve decided you want to buy a property, maybe your own home or an investment property. Well the next step is going to be to find out how much you can borrow. In almost all circumstances the best way to do that is to go and visit a mortgage broker or to pick up the phone, give the mortgage broker a call and they can assess the loans, assess what you want and work out for you what your borrowing capacity is, what the best loan is going to be, where you can expect in repayments and so forth. Today I sat down with Don from Mortgage Choice, we talked about exactly how you can get in contact with the mortgage broker. Often we shy away from getting in contact with these experts and we prefer to go with the online calculators instead. In the previous video we talked about the accuracy of those online calculators, truthfully they are not that accurate. If you want a solid figure on what you can borrow then there’s no better place to go than a mortgage broker. So what’s the best way to get in contact with them and then how the processes flows after that? Don: To find a mortgage broker I would think of google ‘mortgage broker’ in your suburb is the best place. Don: …or talk to someone you know about that has an investment property or the mortgage and look for recommendation. Recommendation of someone who has done a good job and who knows what he is doing is really good thing. How much you can spend and getting the preapproval is.. you can go to a lot of different mortgage brokers and not always getting any advice and not getting the some figure so you need to deal with someone you’re comfortable with. It’s not just the recommendation from a friend or a relative, that person might not suit every person so do your homework and go with someone you’re comfortable with. You got to get the result of what you want but you have to deal with someone you’re happy with. Ryan: Different mortgage brokers will have different expertise, different types of properties or investment strategies as well and then you have to look at that personal relationship because I guess you are going to be doing a fair amount of work together, you are going to be letting this person know a lot about your situation so you want it to be someone that you can trust and not someone that you feel awkward around. Don: Absolutely, you have to deal with someone who is available, you can ring them seven days a week, he can answer questions or require** because if you are fairly new, you are not a sophisticated investor there is lot of job and a lot of information so you want to be able to get your answers questioned in a reasonable period of time. Good mortgage broker needs to return ***the calls and make everyone comfortable and feel like they want the questions to be asked. You want to be able to do all of your handwork and have someone in your team who can really help. Ryan: What about in what buying cycle should people approach the mortgage broker? Should they do it before they even start looking or should they wait until they are I guess in the process of actually looking and then find the property, what would you suggest? Don: I would always suggest at the very start. The first step is to find out what you can borrow. If someone is out there looking for properties, if they don’t have a clue find of what you can borrow is not necessarily the right order. So I think, get a mortgage broker first and find out what you borrowing ability is, get it preapproval and then go out and do your research. Ryan: They are coming first thing, to find out how much you can borrow so then when you go out to the market you can say “well I can afford to look some around this is the price range I should be looking at” which I think is great. So when we go to see a mortgage broker in that first meeting does it need to happen in person or can we do it long distance? Don: Ideally in person is the best way because it is the only way you are really going to get to know the buyer if that’s possible. For example, I’ve got clients all over Eastern City Board and Australia an overseas. I might admit that in some stage and if happen that they are happy with me for many many years so ideally yes, but it’s not always possible. Ryan: For some people who might be in rural areas or people who are not necessarily happy with the mortgage broker in the area and definitely look outside the area for mortgage brokers like yourself or anyone else. For the first meeting most people would want to do a face to face so they can get to know the person and build that trust but then after that most of it can be done over the phone or over email. Don: Absolutely, a lot of clients say they really want to find out***. It’s the first thing they want to do and so it is for the rent, home loan or investment and quite often they are working****A lot of mortgage people set business sales so sometimes I got go see people at 7 in the morning or 6 or 7 at night because that is the only time we can get together. That happens every single week that is usual but that’s okay, if it means getting the client comfortable, that’s that it is all about. Ryan: Some mortgage broker would come to your home or in some cases you come to an office like I’ve come today, that’s really up to a individual mortgage broker that you’re working with, that is how they work. 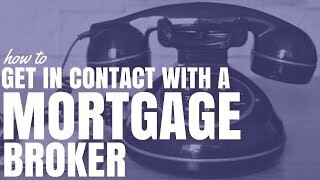 Really the best way to get in the contact with mortgage broker would be as Don said to google it and give them a call, a lot of people these days are afraid to pick up the phone and call. If you liked what Don hat to say, you want to get in contact with him, you want to know how much you can borrow then I made it super easy for you, just go to pca.im/don which is my short link which will get you directly to his website and give you his contact details.